Vocal compression is something you can’t just approach in a half-assed manner. Quite the contrary. Adjusting it requires a certain confidence and – as the title says – boldness. Yet, most beginners seem to be afraid of compressing vocals. It results in an ineffective way of handling the track and the effect itself, so the goals of using compression aren’t met in the first place. The reason behind this failure is understandable though. If you want to compress the human (singing) voice effectively, you have to understand what it is for first. The first and probably the most important reason to compress vocals is to reduce its dynamic range. Don’t get thrown off by the smartass-sounding language. What it really means is, you need to get it to a reasonably steady level. The human voice has got naturally large level fluctuations; there are big differences between the loud and the soft parts. Putting that against a usual pop/rock music arrangement uncompressed will surely result in complete failure. Part of why the amateur sounding mix is so easy to spot is because the engineer didn’t use enough compression. Or they didn’t use any at all. If you hear suggestions to not use any compression on vocals, cause you might be able to get away with it and get a more natural sound, you can be pretty sure that the person giving the advice hasn’t tried to mix anything seriously before. Of course there are those rare exceptions when you can indeed get away with minimal or no compression on the vocals. It’s those incredibly sparse arrangements. Usually nothing more than an acoustic guitar and a voice. And still, even in those cases, compressing the singer would give you better sounding results. Do you know the kind of guy who brags about not using any compression in his mixes, including the vocals? They’re gonna tell you how they rode the levels manually. Let me tell you, this can work. But when you go into the details of a track and try to draw in a perfect level riding curve, in the end it’ll turn out to be pretty much what compression is. Even then, certain desirable side effects like the breathiness or throatiness (depending on the compressor type and settings) won’t be present on such a track. Of course level riding has its uses, especially in the old-school way, during recording. Look at it as a pre-compression phase. It’s also an artistic expression that accentuates the track in a desired way. So how to compress that voice? First of all, don’t do it with your eyes, at least not right away. Forget the meters on the compressor. Instead, listen to what it really does to the singer’s voice. Don’t solo the vocal track, let the whole thing play together, so you can adjust the amount of compression (the input or the threshold, depending on the device) to make sure that no lines, phrases and words disappear against the rest of the music. You’ll quickly realize that a certain kind of heavy handedness is required. Vocal tracks can take a lot of compression; in fact, in many cases, they downright need it. As far as ratio goes, anything from 2 to 6 is nothing unheard of. Going higher than that and approaching limiting is unnecessary, except maybe in extreme cases. You can usually just press the “4” as the go-to button on an 1176 style unit, as far as vocals go. 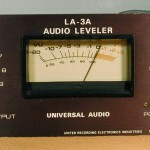 Program dependent compressors or ones with at least an auto-release function also handle vocals perfectly. These respond to the incoming signal in a variable way, depending on the level of the transients. 5-6dB gain reduction in the peaks are pretty standard, sometimes even higher as well. Don’t be scared to use and abuse the thing, and pay less attention to the actual numbers. Some of the pseudo-pros (really just unsure nitpickers) will tell you to go parallel, or use two or more compressors to sort of “cushion” each other, and get a more transparent sound. While parallel compression can do the trick on the more subtle, softer material, doing the chaining-up thing usually doesn’t give you anything special over using just a single unit. It’s kind of the smoke & mirrors of compression. Combining different attacks and releases on the separate units will not sound all that pleasant either; it actually kinda defeats the purpose and can render one (or more) units in the chain unresponsive. If you have attack knobs on your compressor, make sure that you don’t completely eliminate the transients. Those can carry a lot of power in a vocal track. Just don’t let them hit as much as the snare or the rhythm instruments; that can come off unnatural and makes the track hard to balance level-wise. A well-used compressor on a vocal track can bring out interesting, hidden secrets in the voice. The above mentioned throaty or breathy quality, as well as a crispy but not harsh top end are pretty standard “side effects”. Vocal compression – when done the right way – will also keep the track intelligible and balanced over the music.